It is past 1.5hrs since berbuke puase time. My hubby still hasn't home=( huhu..
so while waiting for him, here another post for u all. Hm..if u all can remember, another thing that makes me pening is tudung. Until the wedding day itself, i haven't decided on the style. 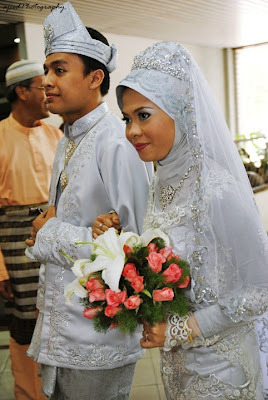 I think d hijab style for my wedding was basically determined by fate. Mcm ni..all my 3 make up sessions, all done in rush. For my nikah, the MUA came in late!plus i have to perform zohor first. So, we just got exactly 1 hour to finish everything. dah x sempat, I just grab tudung bawal n wore it like i wears it everyday T_T...huhu..
the MUA put the labah2 (which i pesan i dont want...) so I ask him to hide it inside my veil. haishh...So, that's the story.haha..that's y my tudong senget2 T_T.. 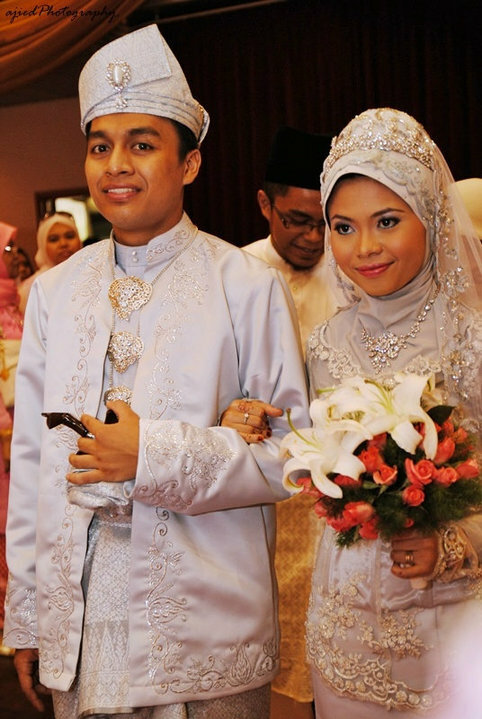 The tudung that I wore during solemnization-tudung bawal pakai hari2. LOL! Next, my recpetion tudong. Again, my MUA arrived quite late T_T..
Lucky me, I was still looking gud in anak tudong=p ahaha.. The look was totally out of my list! This time the MUA came in time. But, I have to wait for the baju pulak. The MUA finished his job at 1130. SO, i have to wait for more than an hour for the dress to arrive. While waiting, maybe the MUA tu feeling guilty, he pon did experiment on me. That's how I got my sanggul tinggi. I was really scared cz I was not sure whether the sanggul tinggi suits my face. After all, it looks fine in the photos. Take a look. Three different looks without I actually planning it. That's why I said its all determined by fate. However, alhamdulillah..all looking good (at least in my eyes). Promised my fiance that he'll get a pretty bride. Hope I did fulfilled the promise..
i'm a silent reader and this is my first time commenting on anyone's blog.i find ur comments totally hilarious but down right honest! i'm impressed with how u've handle everything :) Alhamdulillah everything went smoothly despite d hiccups.